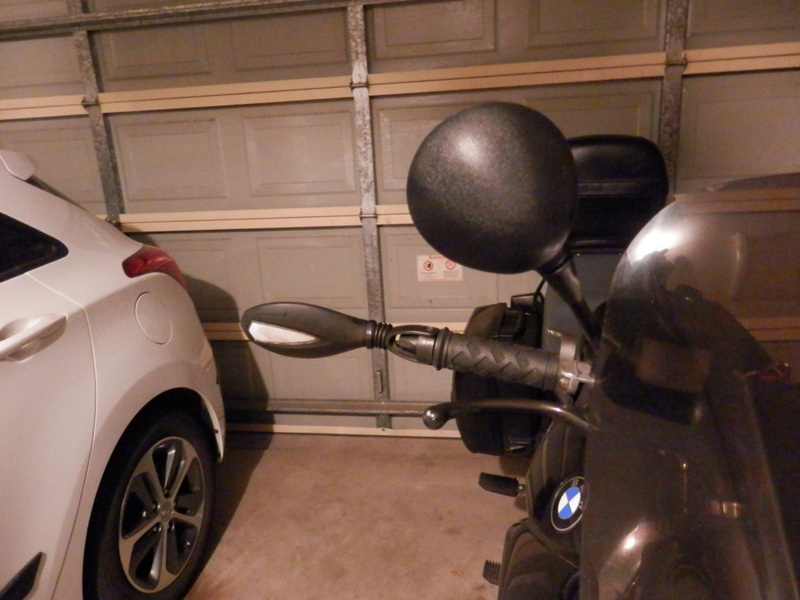 a) I was cruising at around 110km/h when I let the bike gently brake on the engine from about 120km/h to 90km/h. b) At the same time i lifted the left hand from the handlebar, steering with just the right hand. c) The bike suddenly started to progressively wobble on the tail until I, rather stunned, had to grab with two hands and engage the clutch to stop it. I managed to reproduce this 2 times, only at high speeds. I have been away for 4 weeks and it was the first ride coming home. There is now a distinct low frequency vibration coming from either the engine, the wheel or the shaft (I think). Almost like a tapping/clunking feeling or as if there were small perpendicular grooves in the road. This happens when I drive at around 100-120km/h or around 5000RPM. Distinct in 5th gear, also noticeable in 4th gear. 1) What should I suspect first ? I have no idea how to troubleshoot this. 2) I worry about driving her now, should I park her until further notice ? Going to/from work today, no wobbling, but noticeable vibration. 3) I read in one post about an old Airhead that "made a rattling noise when decelerating and only in top gear. It went on like that for years (and 80,000 miles) until I had the money and time to repair it. The fifth gear cog was worn and 'wobbling' slightly on the output shaft. " Could it be the same ? I thought the transmission/gearbox was a different design. The tyres are 7 years old, a bit flat, but still plenty of groove. I re-inflated them to 2.3bar (front) / 2/5bar (rear). The engine oil was changed 5W-40 this year. The drive shaft oil has not been changed since purchase (supposedly) last year. Your input and advise would be highly appreciated. I bought the bike almost a year ago, use her often for work. I have put about 7000 km on her so far. I love the bike but being used to boxers I am still learning the driving characteristics and how to listen to the symptoms. What do you mean by old tyres? Anything 2012 or older should be binned. @92KK 84WW Olaf wrote: What do you mean by old tyres? They are 7 years old. I am planning to change them in the near future. Are you saying that tyre age alone could cause wobbling ? Have any of the wheel balance weights come off? I have 38 psi front and 42psi rear, 2.3 bars sounds a bit soft. @ERasberg wrote: . . .
c) The bike suddenly started to progressively wobble on the tail until I, rather stunned, had to grab with two hands and engage the clutch to stop it. . . .
. . . I worry about driving her now, should I park her until further notice ? . . .
Not riding on old tires is a good idea. That eliminates worrying entirely. Avoid one-handed steering at fluctuating highway speed on under-inflated tires—old or new. Two-handed steering on correctly inflated tires is preferable in most cases. Replace your tires if older than five years, like Olaf has indicated. Check tire inflation regularly. Replace the fork oil. Check the front wheel bearings for play. Persistent obsession with undifferentiated mechanical noise, and reading of other rider's problems with Airheads might ruin your ride, once you start riding again. Wear earplugs; read gardening magazines. Wow, where did you dredge up the explanation I gave years ago for a noise in my '77 R75/7 gearbox?! It is doubtful an internal gearbox issue, if one existed, would have anything to do with a steering wobble. Glad it didn't turn into a proverbial tank-slapper! I agree with the aforementioned increase in tyre pressure and in replacing them as soon as is practicable, but where does a vibration come from? Tyres can have internal stress cracks. Seven years is a long time even if the moto was kept in storage. You have a Monolever not a Paralever rear end so there wouldn't be any play in the pivot bearings that don't exist. However, grab the back tyre/wheel with the bike on the centrestand and see if there is any noticeable side to side movement. The large bearing inside the final drive could have excessive play. Mine shook it’s head badly when I first rode it home. I second the balance weight suggestion. I had one come off on my k1 (rear wheel) and vibration was so bad the gear lever fell off ! Luckily I found it in the garage, stuck it back on and problem disappeared. I never go more than 2 years without new tires on any of my bikes that I travel on.My vintage stuff that I only put a few hundred miles a year on are a different story.Decent tires cost about 200 US and if you pull the wheels off yourself mounting them is cheap . Riding on old rubber is the worst thing you can do .If it rains and you are forced to ride in it going down becomes a real possibility .It's just not worth it. This being said , how many miles a year do you ride that you can have 7 year old tires on a bike and still have them with tread? Using a bike lots keeps it in much better working order than not using it a lot. I'd fit new tires on that bike and have the wheels balanced before I started looking at anything else. Thank you to everyone (@Olaf, @Point-Seven-Five, @Laitch, @Two-Wheels-Better, @nobbylon, @Ringfad, @Dai, @yamaguzzi) for the great input ! Much much appreciated. To recap, there are two main contributors to investigate : Tyres & Suspension. b. I researched tyres all yesterday evening and will most likely order either Avon Roadrider am26 or Bridgestone Battlax Bt-45 tyres. Opinions welcome of course. c. Balancing is key. I will definitely have to check that. They have been balanced and do have weights on them, however if there are internal cracks this could change all that. d. The recommended inflation pressure dating back to the 80s might not be a good guide. Most people seem to inflate to higher pressures than the recommended 2.25/2.5 bars. I will increase pressure in the current tyres and see what happens. I have left it as per the previous owner which appears fine, but I will do a few adjustments and see the difference. Fork oil was changed 5 years ago. I will replace it when possible, although I don't expect it to be the source of the vibration. In my opinion, and looking at motorcycle built physics, a bike should be able to run in a straight line pretty much by itself. Steering with one hand should be highly doable from a driving technical standpoint. The safety aspect is something completly different of course. I drive it regularly and have covered about 7000km/4000miles since buying it last year. She was not driven much in the 10 years prior to the purchase and the bike still has the tyres from the previous owner on. The were hardly worn at purchase, but a bit flat probably due to underinflation. Where did I find Two-Wheels-Better's explanation? Nothing escapes my microscope when I research bike-issues. If you do your own tire mounting and balancing, I would strongly suggest checking the balance of your wheel WITHOUT the tire and note the heavy point. I have found that on my bikes the heavy spot can be as far as 60 degrees from the valve stem. Checking balance on a naked wheel will make balancing the tire much easier and require less weight. Agreed, .75. My K1300GT with tyre pressure monitors requires six 7 gram (1/4oz) opposite the stem to balance the front wheel alone. I have considered removing this feature, disabling the function with my code scanner, and retroing to rubber valve stems. I don't have the skills to change tyres or balance the wheels so I leave that to a mechanic. Ordering Bridgestone Battlax tyres tonight and will have them fitted within the week, I hope. Let's see if that makes the difference. I still have this weird feeling that there is a knocking/rattling effect in the shaft drive. Today I felt the vibration at lower speeds and gears as well, around 70km/h. Anyway it's so hard to tell when driving. I'll keep you posted once I change tyres. I plan to troubleshoot this one thing at the time, meaning not change several parameters in one go, I really want to understand what is causing this. Have you checked the very basics yet like....centre stand the bike, slowly spin the rear wheel, listening for clunks which might indicate a failing u-joint, even abnormally worn drive splines? Yep I've done that check twice, when I first experienced the wobble as well as today. Also checked for sideways play etc. It all looks fine as far as I can tell. I figure, in any case I need new tyres, so that is an expense I can't avoid, therefore a good place to start. However if that doesn't sort it out, I will probably try to open the final drive and check the splines. Is there a procedure for doing that on the forum ? It would be the first time I attempt the job. Have you checked the front fork bearings(top and bottom of the triple tee). Over time, the grease dries up and the handle bar become hard to move. With your bike on the center stand, you should be able to turn the fork both ways without any force and it should be smooth without any hard point. If the grease is hard and had turned to be like a varnish, as a temporary fix, you can spray WD40 on the bearings. It will soften the grease again. Good advice! I'll do that tomorrow. That could definitely be a contributing factor. Thank you. You're feeling for a distinct 'click' or resistance as the bars start to turn. If it's there then the bearings have brinnelled and need replacing. @ERasberg wrote: Thank you to everyone (@Olaf, @Point-Seven-Five, @Laitch, @Two-Wheels-Better, @nobbylon, @Ringfad, @Dai, @yamaguzzi) for the great input ! Much much appreciated. I went with the Avon Road Riders . They performed real well two weeks ago on a 1300 mile ride I went on fully loaded with gear. I rode in hot weather,rain,interstate,paved back roads,and some dirt roads in state parks with no issues at all . Since mounting last December I have put around 3000 miles on them and they are still in real good condition. I usually get around 7-8 thousand miles out of them before replacing . I like to keep good rubber between me and the road. I see quite a few references to tyre pressure at 38/42 which in a lot of K miles I have also found to be optimum. I found what I think is the problem : tyres are cracking. I have attached 2 pictures of front/rear tyre. Over the last couple of days I have monitored the tyres closely, "over-inflating" them progressively until I got to Front=2.6bars/38psi and Rear=2.75bars/40psi when things started to happened rather quickly. 2 distinct perpendicular cracks started to develop, 1 on the front tyre and 1 on the rear. I think by inflating the tyres I pushed some internal cracks to the surface. I am seeing more tiny cracks developing, so the tyre is likely quite porous inside. These cracks developed from literally nothing over the course of 45 km. It is not loosing air pressure however. I hope putting new tyres on will sort out the symptoms and wobbling. Thank you for your very useful input ! Without your comments I probably would not have been so vigilant. @Crazy Frog @Dai : I did the bearings check. They are fortunately fine. @yamaguzzi I'm getting the Avon Roadrider AM26 tyres as well. Looking forward to testing my first set of Avon tyres. Heard so much good about Avon. I would definately NOT ride on those cracked tyres! I’ve never seen that before. I have seen that quite a few times and mainly on Avon tyres but not exclusive to them. They look like Pirelli Sport Demons. I like those tyres a lot, but I once had a front SD crack across the tread like that, as though I'd hit something. I stopped running Avon Venoms because of cracking in the bottom of the sipes. They gripped well and were wearing well until I discovered the cracking. I bought another Venom and had the same problem. I then tried Bridgestones, I found Bridgestone BT45's gripped well but wore quickly only 8000 K's. I'm currently running Michelin Pilots Activ but on just purchasing a new front a couple of weeks ago I was told they are to be discontinued. I'll probably go to Shinkos next which when I priced them were the same price as the Michelins $120.00 Au front front one $135.00 AU for the rear fitted. You had to remove the wheel or pay extra. @ERasberg wrote: I found what I think is the problem : tyres are cracking. I have attached 2 pictures of front/rear tyre. 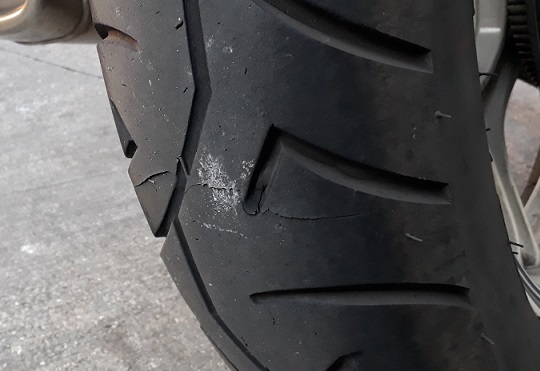 not to worry though ...I have ridden with the cracks ...after deflating somewhat to somewhere near 28-30 psi front and 34 rear ...for some many thousands of kilometers with little noticeable abnormal wear or effect , or even deflation with the cracks as shown. I just ordered Avons so I hope i wont have the same cracking issue with them. The cracked ones are Sports Demons. I'm thoroughly under-impressed with them despite all the praise they receive. Mine clearly didn't age well. And @nobbylon I agree fully with you and obviously parked the bike once I identified these cracks. 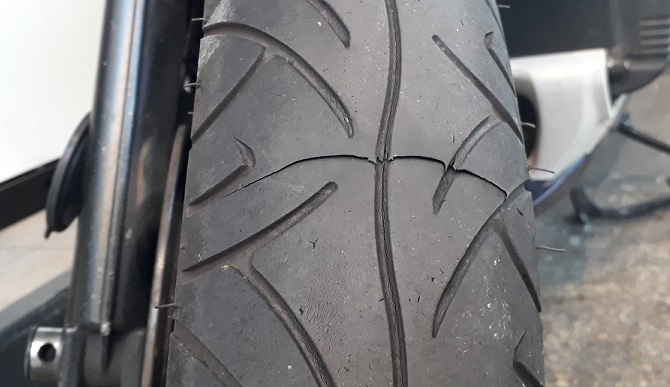 My key message was that internal cracks can surface quickly, in my case over the course of one 45km ride, and go from what appeared to be an intact tyre (seen from the outside) to a full perpendicular crack. AND without a noticeable difference in handling hence my newfound awareness for this topic. @MartinW : thanks for the input on tyre choice. I was torn between AM26 and Battlax, in the end ordering AM26. I was looking for Michelin Pilot Activ, but couldn't find a matching front tyre. Will check out Shinko. @Charlie99 : Thanks for the input. I think this is why inflation pressure is key, to ensure the risk of this type of damage is reduced. When leaning over have definitely not felt comfortable on these tyres, probably linked to the effect of the internal cracks. I have not seen anything like this on my other bikes, I have probably taken tyres too much for granted up until now. It has certainly given me a bit of a scare. Rubber is so important. So far I’m really impressed with Sport Demons, 38/42 psi. They seam predictable so far but I’ve only done 1000 miles on them. Will keep an eye out for cracks now I’ve seen this thread, thanks. @nobbylon wrote: So far I’m really impressed with Sport Demons, 38/42 psi. They seam predictable so far but I’ve only done 1000 miles on them. Will keep an eye out for cracks now I’ve seen this thread, thanks. Glad to hear that. I'm sure it's a great tyre and I do not think this is anything to worry about in your case. I bought the bike last year, it had been stored for many years, so the tyres was not worn at all but 7 years old. This is most likely the cause of the poor performance. I was told the golden rule for motorcycle tyres is max 5 years old. @ERasberg wrote: The cracked ones are Sports Demons. I'm thoroughly under-impressed with them despite all the praise they receive. Mine clearly didn't age well. At seven years of age, as you said, I'd say a few cracks is alright. I just didn't realise the tyres deteriorated as much with age as they apparently do. @ERasberg wrote: I just ordered Avons so I hope i wont have the same cracking issue with them. I rode across North America on Avon RoadRiders fitted to my Moto Guzzi 850-T 10 years ago with no problems . Fully loaded with gear I got about 7000 miles out of them before I replaced them with new RoadRiders forthe 2nd half of the trip .Did another long distance ride up to Nova Scotia with them 5 years ago again with no problems. Made more trips under 3000 miles on them than I can count over the past 10 years with no problems .Never saw tires crack like I'm seeing in this thread . When I travel I travel heavy with gear because I camp and also cook .I go on the cheap and that takes gear. My pack weighs about 200 lbs ( like a passenger) And even with that weight I've never had a problem. I use the V rated ones. For another 7 or 8 years before the RoadRiders I rode on Avon Road Runners until they discontinued the sizes I needed .I liked them better but found the RoadRiders to be good tires as well. This has been my experience with them . I find the Battlax BT45 front tyre will scallop and crack if you let the pressures be too low. I always run 38 and no problems with them. I keep a simple single barrel foot pump in the shed beside the bike on the basis that its so easy to check and sort tyres without undoing anything. @92KK 84WW Olaf wrote: I find the Battlax BT45 front tyre will scallop and crack if you let the pressures be too low. They are dual compound rubber. The sides are a lot softer than the middle. If the pressure is too low, the sides will touch the pavement when riding straight and will deteriorate very rapidly. I experienced this with my first Battlax and had to replace the tire after only 5k. Which is exactly why I will say do not run them under 38psi. Means you must keep checking them, but I love the behaviour in winter and wet weather. I use the K all year. As for not being able to take your hands off the bars.....I personally don’t want a bike that shakes it’s head if i’m not hanging on! My RS after being set up with correct oil and alignment is rock solid and I can take my hands off at any speed I do and yes I have done it. This is especially pertinent to the RS for overtaking as the short bars require me to stretch my neck so much to look over my shoulder it’s easier to take a hand off to give a better look over my shoulder (on motorways). The last thing I want to be doing is fighting an unstable bike which I don’t believe the K is. @nobbylon wrote: This is especially pertinent to the RS for overtaking as the short bars require me to stretch my neck so much to look over my shoulder it’s easier to take a hand off to give a better look over my shoulder (on motorways). Presumably not the right hand though. That could turn into a Sisyphean dilemma. Or do you reach across and control the throttle with the left hand? I drive on the right (mainland Europe) so most of my motorway looking is over my left shoulder. I usually signal with my hand as well as my indicator. It’s the one thing I don’t like about the RS riding position, you either rely on the mirrors (stupid imho) or you take a hand off to turn and take a proper look. @nobbylon wrote: I drive on the right (mainland Europe) so most of my motorway looking is over my left shoulder. It's right side driving here too but I'm looking every which way on multi-lane expressways, including looking up to avoid frozen excreta dumped from airliners. So far, so good! 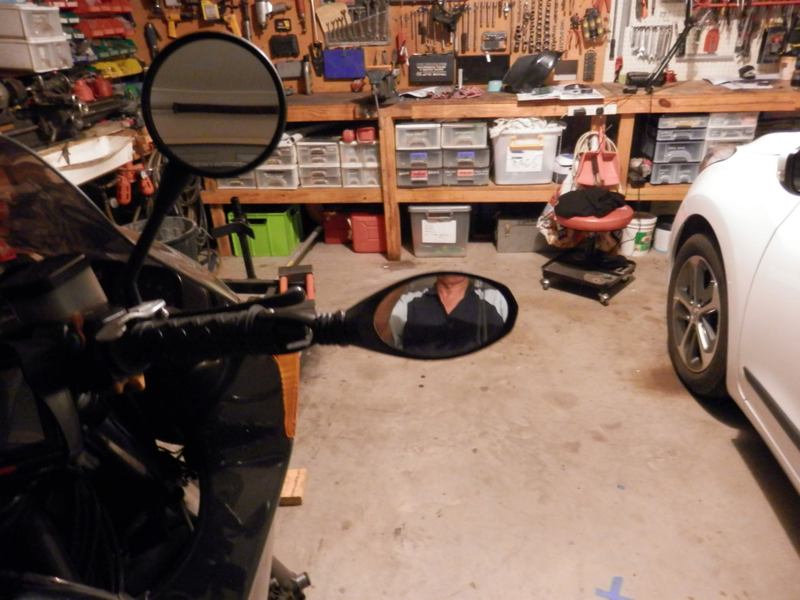 Two extra mirrors eliminate any blind spots. However still look up to avoid riding under birds, especially Pelicans.